Recently, the Ionic team announced an open-source spiritual successor to Apache Cordova and Adobe PhoneGap, called Capacitor. Capacitor allows you to build an application with modern web technologies and run it everywhere, from web browsers to native mobile devices (Android and iOS) and even desktop platforms via Electron — the popular GitHub platform for building cross-platform desktop apps with Node.js and front-end web technologies. Ionic — the most popular hybrid mobile framework — currently runs on top of Cordova, but in future versions, Capacitor will be the default option for Ionic apps. Capacitor also provides a compatibility layer that permits the use of existing Cordova plugins in Capacitor projects. Aside from using Capacitor in Ionic applications, you can also use it without Ionic with your preferred front-end framework or UI library, such as Vue, React, Angular with Material, Bootstrap, etc. 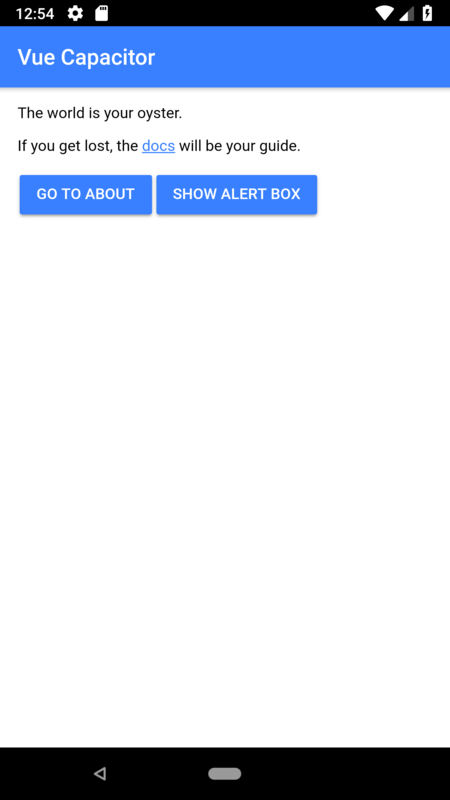 In this tutorial, we’ll see how to use Capacitor and Vue to build a simple mobile application for Android. In fact, as mentioned, your application can also run as a progressive web application (PWA) or as a desktop application in major operating systems with just a few commands. We’ll also be using some Ionic 4 UI components to style our demo mobile application. Capacitor is an open-source project, licensed under the permissive MIT license and maintained by Ionic and the community. You can use Capacitor to build apps with one code base and to target multiple platforms. You can run a few more command line interface (CLI) commands to support another platform. Capacitor doesn’t get in the way when you need access to native SDKs. An app built with Capacitor uses standard web APIs, so your application will also be cross-browser and will run well in all modern browsers that follow the standards. You can access native features of the underlying platforms by adding plugins or, if you can’t find a plugin that fits your needs, by creating a custom plugin via a simple API. You’ll need Node v8.6+ and npm v5.6+ installed on your machine. Just head to the official website and download the version for your operating system. To build an iOS app, you’ll need a Mac with Xcode. 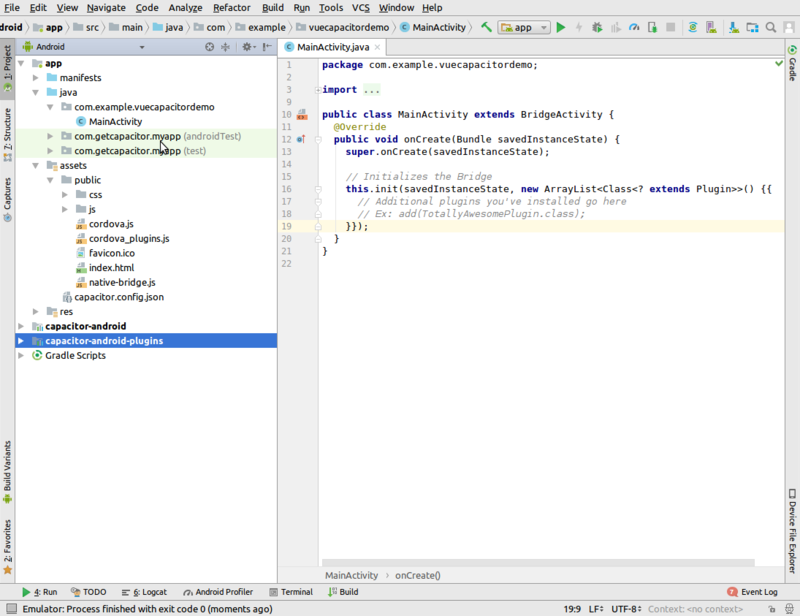 To build an Android app, you’ll need to install the Java 8 JDK and Android Studio with the Android SDK. 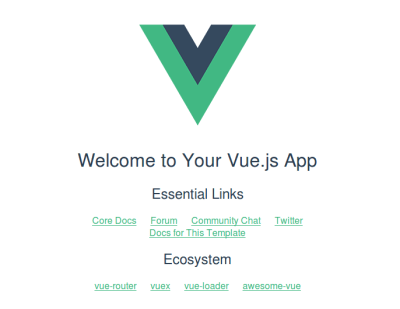 In this section, we’ll install the Vue CLI and generate a new Vue project. Then, we’ll add navigation to our application using the Vue router. Finally, we’ll build a simple UI using Ionic 4 components. You might need to add sudo to install the package globally, depending on your npm configuration. Your front-end application will be running from http://localhost:8080/. To be able to use Ionic 4 components in your application, you’ll need to use the core Ionic 4 package from npm. So, go ahead and open the index.html file, which sits in the public folder of your Vue project, and add the following &lt;script src='https://unpkg.com/@ionic/core@4.0.0-alpha.7/dist/ionic.js'&gt;&lt;/script&gt; tag in the head of the file. You can get the current version of the Ionic core package from npm. ion-app is an Ionic component. It should be the top-level component that wraps other components. router-view is the Vue router outlet. A component matching a path will be rendered here by the Vue router. [Vue warn]: Unknown custom element: <ion-content> - did you register the component correctly? For recursive components, make sure to provide the "name" option. Those warnings should now be eliminated. Let’s add two components. First, remove any file in the src/components folder (also, remove any import for the HelloWorld.vue component in App.vue), and add the Home.vue and About.vue files. This imports the Vue router and the “Home” and “About” components. Now that we’ve set up routing, let’s add some buttons and methods to navigate between our two “Home” and “About” components. Now we need to add a button to go back to home when we are in the “About” component. When running the application on a real mobile device or emulator, you will notice a scaling issue. To solve this, we need to simply add some meta tags that correctly set the viewport. Create a new Capacitor project from scratch. Add Capacitor to an existing front-end project. In this tutorial, we’ll take the second approach, because we created a Vue project first, and now we’ll add Capacitor to our Vue project. We are using npx to run Capacitor commands. npx is an utility that comes with npm v5.2.0 and that is designed to make it easy to run CLI utilities and executables hosted in the npm registry. For example, it allows developers to use locally installed executables without having to use the npm run scripts. The init command of Capacitor CLI will also add the default native platforms for Capacitor, such as Android and iOS. You will also get prompted to enter information about your application, such as the name, the application’s ID (which will be mainly used as a package name for the Android application) and the directory of your application. After you’ve inputted the required details, Capacitor will be added to your Vue project. The application’s name is vuecapacitordemo, and its ID is com.example.vuecapacitordemo. The package name must be a valid Java package name. You might also notice that a file named capacitor.config.json has been added to the root folder of your Vue project. Just like the CLI suggests when we’ve initialized Capacitor in our Vue project, we can now add native platforms that we want to target. This will turn our web application into a native application for each platform that we add. But just before adding a platform, we need to tell Capacitor where to look for the built files — that is, the dist folder of our Vue project. This folder will be created when you run the build command of the Vue application for the first time (npm run build), and it is located in the root folder of our Vue project. If you look in your project, you’ll find that an android native project has been added. That’s all we need to integrate Capacitor and target Android. If you would like to target iOS or Electron, simply run npx cap add ios or npx cap add electron, respectively. Capacitor also provides an API that you can use to build custom plugins for the native features not covered by the set of official plugins provided by the Ionic team. You can learn how to create a plugin in the docs. You can also find more details about available APIs and core plugins in the docs. Let’s see an example of using a Capacitor plugin in our application. 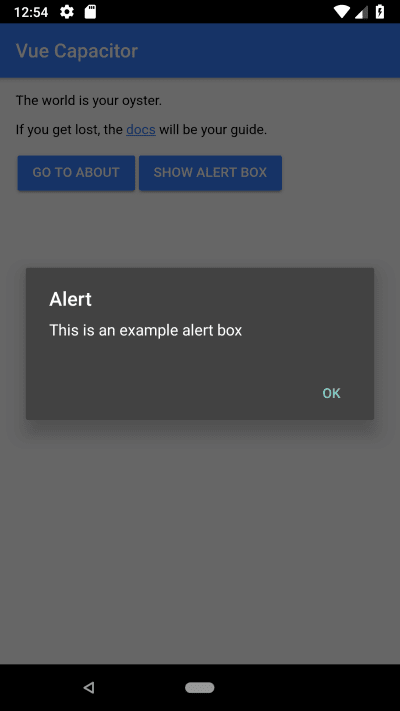 We’ll use the “Modals” plugin, which is used to show native modal windows for alerts, confirmations and input prompts, as well as action sheets. This code imports the Plugins class from @capacitor/core. You can find more details in the docs. Generate a production build of your Vue application. Copy all web assets into the native project (Android, in our example) generated by Capacitor. Open your Android project in Android Studio (or Xcode for iOS), and use the native integrated development environment (IDE) to build and run your application on a real device (if attached) or an emulator. Either Android Studio will be opened with your project, or the folder that contains the native project files will be opened. If that doesn’t open Android Studio, then simply open your IDE manually, go to “File” → “Open…”, then navigate to your project and open the android folder from within the IDE. 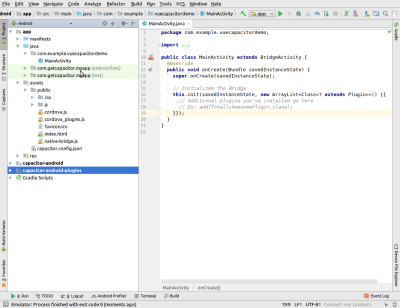 You can now use Android Studio to launch your app using an emulator or a real device. In this tutorial, we’ve used Ionic Capacitor with Vue and Ionic 4 web components to create a mobile Android application with web technologies. You can find the source code of the demo application we’ve created throughout this tutorial in the GitHub repository.